Should Athletes Sprint on Their Heels? He also wrote 8 Reasons Athletes Injure Their Hip Flexors, a great read if you missed it. I’m not entirely certain at this point if many coaches, trainers, therapists, and the rest of the sports medicine community are completely aware of whether or not athletes should sprint with their center of mass over the front (forefoot dominance) or back (rear foot dominance) to encourage greater running speed. The answer to this common debate is that our greatest speed and power potential occurs when we keep or shift our weight over the front of our foot when sprinting. This essential technique is known as “Forefoot Dominance.” Increased ground contact time (GCT), potential energy loss, loss of momentum, a poorer stretch-shortening cycle in the muscle, greater deceleration, and more are adverse effects associated with a lack of forefoot dominance when sprinting. It’s definitely not a good thing. What muscle and joint actions in the swing leg occur when an athlete overstrides? Excessive knee extension and loss of hip flexion! I think factors #1 and #2 coincide with one another naturally so I’m going to address them as one. Either dominant quadriceps or weak superior hip flexors which we commonly see with proper testing procedures in training can contribute to an unfortunate overstride pattern and a slower athlete. I’ll be writing another article shortly that introduces our Psoas training progression that coaches and trainers can implement into their programs immediately to assist in the prevention of overstriding and subsequent rear foot dominance. I’m not entirely certain but excessive tone of the Rectus Femoris muscle may be the culprit here since it extends the knee and flexes the hip below 90 degrees. Below you can envision this outcome based on its arrangement across the front of the pelvis down through the knee. The next potential origin of rear foot dominance and overstriding is weakness at the distal or lower end of the hamstrings. Traditionally, the lower end of this muscle group has been deemed overactive and stronger than the upper end for various reasons (Anterior Pelvic Tilt, Exercise Selection, etc. 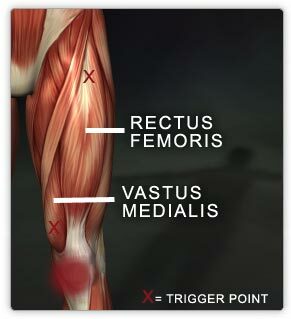 ), but this is just relative to both ends, not how they compare to other muscle groups during athletic movements. I read a great study from Bret Contreras, which noted that hamstring activity is the highest during the late swing phase just before our foot lands back down on the ground during sprinting. What this could mean is that if our hamstrings, particularly at the lower end, cannot decelerate and meet the demand of increased momentum of the lower leg as our leg swings and recovers, then we overstride, run on our heels and of course bad things happen. Thus, specific strength exercises for this aspect of the hamstring muscle group become absolutely essential in preventing this dysfunction. Glute-Ham Raises, Hamstring Curls, Bridge variations, and more are prime examples. Lastly, just lacking power (strength x speed) will automatically predispose an athlete to rear foot dominance. Analyze walking and jogging patterns for a moment. Our mass naturally resides in the rear foot as we perform these movements. When someone runs faster and faster then you see a natural transition of their weight over the front of the foot. 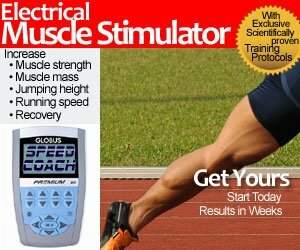 Just another example of the need for higher power output as a pre-requisite for not only greater speed, but also more efficient and effective sprinting technique as well. Do all the A-skips, wall posture runs, and other technical drills you would like, but if you do not have the power then forget about it! According to research, there exists a relationship between speed and both rear foot and forefoot dominance during sprinting. [2,3] The faster we are, the more our center of mass shifts forward onto our toes and vice versa. The solution here would be to ensure that you are regularly performing various methods of strength, power, and speed training, or just accept being slower and running on your heels. In conclusion, just remember that if you are poor in any of the aforementioned areas discussed within this article then you will begin to overstride, which will cause you to become rear foot dominant or run on your heels, and you are left with all of the negative outcomes listed at the beginning. I hope you learned something new from this article, and if there is anything someone wants me to write about pertinent to this topic or others within the speed realm, then please let me know. READ Bryshon Nellum: Track & Field's "Next One"
aspects of sports shoes and playing surfaces:135–142 ,1983. Training: clinical implications. Journal of Athletic Training 33: 216?221, 1998. 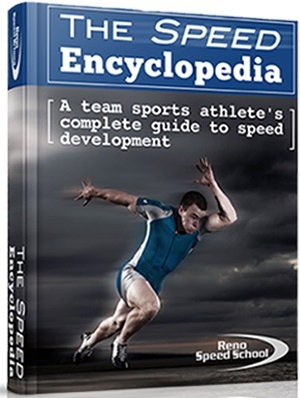 Travis Hansen was the Head Strength and Conditioning Coach for the Reno Bighorns of the NBADL for their 2010 season, and he is currently the Director of The Reno Speed School inside the South Reno Athletic Club. He is the author of The Speed Encyclopedia.